Our bags are coated and last quite a lot longer than a few weeks, even in New Mexico at 7,000 feet. When we quit building over the winter we left some filled bags in direct sun to hold down the tarps that we covered the walls with. They were still intact months later and were just starting to weaken. Of course, the summer sun would have been a lot harder on the bags. So as Owen says, the bags vary a lot. Another hint. If you are leaving bag walls tarped for extensive periods as we do, I recommend “tarping” with 6 mil black plastic. You can get this wide and long, and it seems to last a lot longer than actual tarps. Hessian (burlap) bags have their own problems. They will rot. They’re often treated with chemicals. And they’re often more expensive than poly bags. Would you think that hyperadobe mesh bags or tubes would be more suitable for sun-heavy areas? If the mesh degraded, I wonder if the soil they were filled with would have bonded enough with the previous layer that it wouldn’t make a difference to have lost the plastic structure. Definitely seems like that’s a problem with the solid bags since the soil in each bag doesn’t actually touch the soil of any other bags. I think poly and hyperadobe bags/tubes will all break down in sunlight unless you order a special UV coated material. But that adds to the cost and may not be available. It’s far easier to coat the bags as you go or keep them tarped. Kelly and I recommend coating the bags or keeping the walls tarped, but some bulders have different opinions. Some earthbag builders have good soil like adobe or clayey subsoil that creates solid walls and are not concerned if the bags decompose. The end result is much like rammed earth or adobe construction once the bag material falls off. You do lose some strength this way, but some people are not concerned. i have had the same problem but i mixed my clay with lime and had some other bags filled with sand and cement & it had hold pretty well before the bags braking ..and something else i have notices is that poly bags doesn’t let the adobe filled bags dry complete and when you work on the upper part where you must get on top they seem mushy and the wall seems unstable still with barbwire and re-bar. just my overview of the experience i have had with earthbags. Earthbag walls are extremely stable if you use the right techniques. It sounds like you didn’t tamp your bags solid. Or maybe you didn’t have the right mix or enough clay to bind the soil together. 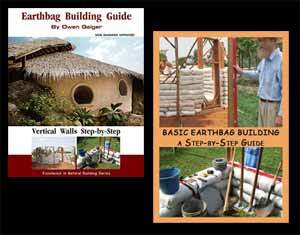 Properly made earthbags are much like rammed earth. Make samples beforehand and experiment until you get the right mix. Most of the time typical clayey subsoil works perfectly. Or you can buy a mixture such as road base so you don’t have to mix anything. 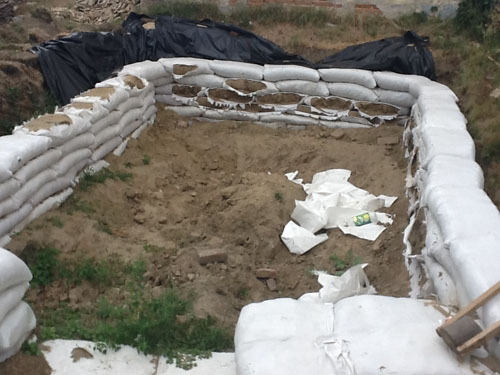 Poly earthbags will allow moisture to evaporate. You probably didn’t wait long enough. Or maybe you added too much water. I add just enough water to bind the soil and no extra. If you see water squishing out of the bags then the soil is too wet. well i did learned as i went up and i started mixing with a drill and then went to mixing in the floor with shovels that was faster and dryer then mixing in a bucket with a drill because using clay with very little water seem to be hard to mix and hard on the drill. and i did tamped my bags but my first bags was too watery to even tamp my mistake of actually laying these bags over the gravel foundation but luckily to the half inch re-bars i hammered through the middle every 3 feet but then on my upper bags i still found that if i lay a line of moist dirt of 70% sand with 30% clay soil when you get on top even if you tamped when you step a bag on the wrong side it will move from is original level and you have to get on top when its already at a certain height and i dont believe ill have to wait to one line of bags to dry before i lay my next one.. another thing is which i had problems tampping the corners on top which seem to place a outward corner which now haves a cool design that wasnt planned but now i know for the next time as it was my first time actually building any kind of home.. soo thanks to you and others who post this new way of building which frees the mind of people thinking that Block and wood is the only way of building .. If you use the right amount and tamp each course solid, then you can walk on the walls and they won’t move or compress. This also requires having a good soil mix. Would a light slurry of clay on the bags have helped these bags? Maybe a light coat of paint? Yes. You can coat the bags as you go with clay slurry or recycled paint or lime wash.
It’s tricky because some bags last longer than others. And, when they do fail, they seem to fail very suddenly. Best to keep the walls covered as much as possible. Consider working under a giant tarp(s) and work in the shade.